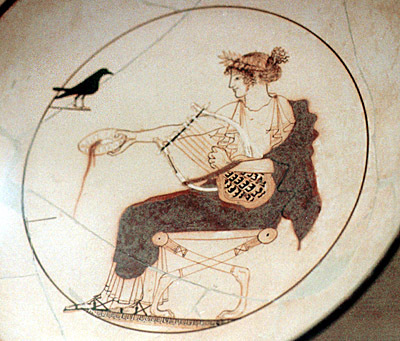 Home » What did ancient Greek music sound like? 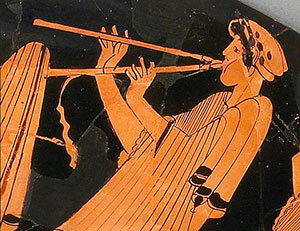 People in ancient Greece loved music, and made it an important part of their lives. Greek people thought of music as a way of honoring the gods, and making the world a more human, civilized place. Unfortunately nobody knows what Greek music sounded like, because there were no microphones to record music then, and the Greeks had no way of writing down music either. People who try to play Greek music now are just guessing. Greek musicians, like earlier Egyptian musicians, played pipes, and lyres, and drums, and cymbals. Their pipes were made from wood or reeds, with holes cut in them for your fingers to play the tune. Some people played pipes vertically, like a recorder, and some played sideways, like a flute. Sometimes people played more than one pipe at a time. People played pipes and drums in a loud, lively way, for dancing, especially when they were worshipping Dionysos, the god of wine and parties. Greek musicians also had lyres, which are like small harps, and sounded something like a guitar. According to the Greek story, the first lyre was made from a turtle shell by the god Hermes when he was a baby, and then Hermes gave it to Apollo. Apollo was the god of reason and logic, and the Greeks thought of music as a great expression of order and patterns. Lyre music was usually played more calmly, and more soothingly, than the pipes and drums. Cite this page: Carr, K.E. What did ancient Greek music sound like?. Quatr.us Study Guides, July 2, 2017. Web. April 19, 2019.